Pad size: 27" x 70"
TENA® SecureTuck™ (aka Harmonie)are designed to cover mattresses in order to absorb leakages, reduce odors and maintain dryness. They consist of a polyethylene layer combined with sealed edges to ensure leakage protection. The highly absorbent material is evenly distributed throughout the core. TENA Underpads for bed or chair protection are designed to cover mattresses in order to help absorb leakage, help reduce odors and help maintain dryness. Fluff pad and contains superabsorbent polymer to maximize absorbency and improve skin dryness. Absorbency. Absorbency. Size. Sense of security. Nighttime. Bed. Chairs. Protect surfaces. Protect furniture. This product is highly absorbent, much more so than any other similar type of pad we have ever tried. 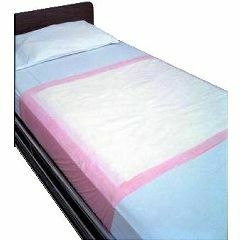 Its size is also excellent; it eliminates the need to use multiple pads, whether on a bed or a chair. We will definitely buy these again. What is the largest size you offer?